In 1693, Vauban decided to build a stronghold from scratch to prevent attacks from Italy. This remarkable construction was set on a bleak plateau, at a height of 1050 metres, dominating the confluence of the Rivers Guil and Durance. 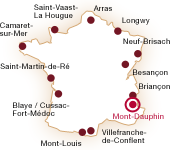 Mont-Dauphin, at that time considered as a modern garrison town, was planned to accommodate 2000 soldiers and as many civilians. Mont-Dauphin is an outstanding ensemble of buildings, still well-preserved today. It is the archetype of the mountain stronghold with an arsenal, the two powder magazines, the barracks on the ramparts and the church which was never completed.